Blue Ridge Numerics, Inc. today announced that Cornell Pump Company experienced a 100x speed up of a full transient system-level simulation and performance curve generation using the new CFdesign Motion and high performance computing (HPC) Modules, released earlier this month. 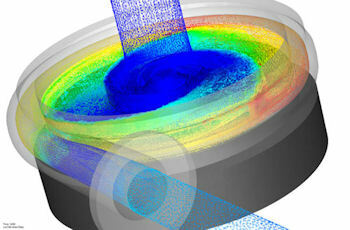 Cornell design engineers were able to perform a series of transient simulations to develop a complete performance curve, enabling evaluation of a centrifugal pump design in only two hours, down from 200 hours, resulting in a significant reduction in product development time. Similar to the Cornell team, multitasking engineers designing high performance fans, blowers, turbomachinery, and many other products can now benefit from the upgraded Motion Module, allowing for more iterations upfront in the design process. View of internal flow patterns of Cornell’s centrifugal pump, modeled with CFdesign, highlighting the pressure of the liquid and the pattern of the flow. Several mechanical engineering applications require understanding of the behavior of liquid and gas flows as they interact with solid objects. The CFdesign Motion Module allows users to create a virtual prototyping environment to better understand these behaviors by simulating the way components interact and respond to prescribed flows. All the physical effects of the motion as well as the time-history are output for data review and to create animations for visual studies. Cornell Pump Company has been providing centrifugal pumps since 1946. Cornell pumps are used in water intake, water processing, pressure boosting, refineries, energy recovery, cooling towers, distillation systems, wastewater processing, mining and power plants. Cornell pumps are engineered and manufactured to provide dependable, efficient and economical operation. R Systems NA, Inc. is a privately held corporation providing high-end computing resources for research. R Systems offers a rapid-response, queue-sensitive production environment with utility or dedicated access depending upon your project. Custom service-level agreements are available if needed. R Systems provides services aimed at benefiting the commercial research community and improving the quality of life throughout the planet. Blue Ridge Numerics, Inc. is the fastest-growing CFD software company in the world and consistently ranked among the fastest-growing technology companies in North America. The company's CFdesign upfront CFD software integrates comprehensive fluid-flow and heat-transfer simulation into early phases of design and engineering, when companies can dramatically improve product quality, time-to-market, and ultimately profitability through the product life cycle. Learn more at www.cfdesign.com.